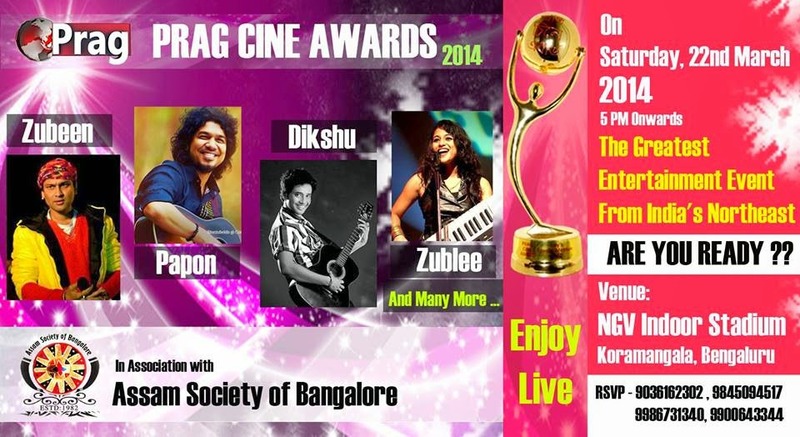 The “Silicon Valley of India”, City Bangalore has been shaped up for the upcoming mega award event for Assamese Film Industry called “Prag Cine Award” to be held on March 22, 2014. This year this mega event is going to host by Assam Society Bangalore. The function is being organised by the Prag AM Television Pvt. Ltd., a satellite channel from Assam and will be held at the NGV Indoor Stadium in Koramangala. Leading cinema artistes from Karnataka and the world of Bollywood are going to participate in the function along with 200 artistes from the North East. In an interview with The Hindu renowned Kannada film director Nagathihalli Chandrasekar said “the awards function would not only bring the film industries of the North East and those of South India closer but would be instrumental in opening up new frontiers and opportunities for both Assamese and Kannada film film- makers”. This is the first time that any award presentation function is going to held outside Assam. Do you want to Promote your Film and Music Video ?!! Do you have any News regarding Assamese Entertainment Industry?!! Do you want to contribute as a Guest Blogger?! !